For the people of Indonesia that has old homes, snail remind them of the miserable Japanese colonial era, so it was forced to eat snails. But why did prestigious snail meat to food in other countries? If you are into France, where there is a famous dish called escargot. What is it? You may be surprised that escargot is a dish made from raw snail meat. In Japan, this is the case, even the processing of this snail is so simple, just to spice ginger, vinegar and sweetener. But, how delicious snail meat that! That is why France and Japan have always relied on snail meat supply. 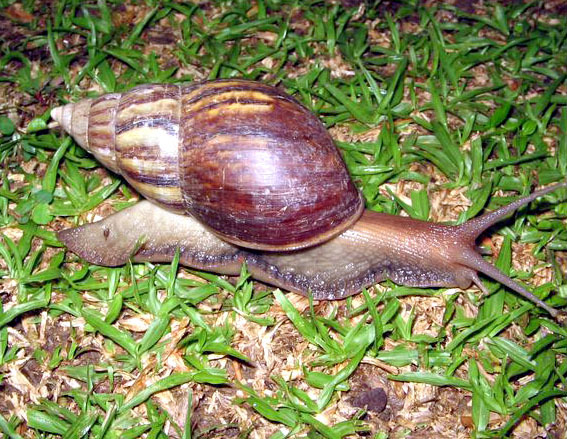 Several other countries also always import the snail meat, such as Hong Kong, Netherlands, Taiwan, Greece, Belgium, Luxemburg, Canada, Germany and United States. We belong to one country exporters of snails. But the volume and continuity not meet the needs of the market importers. Well, not this agribusiness opportunities that lie before our eyes? Perhaps raises a question mark, why do people love the snail meat? Yes, just look at abortion. In order to meet the demands of nutritional adequacy, snail is one alternative that should be taken into account. Creswell and Kopiang (1981) details the chemical composition of the snail, it turns the meat is rich in protein. Snail shells are rich in calcium, and the meat is still there are many amino acids. Meanwhile, other data sources showed that the protein contained about 12 grams per 100 grams of meat. Another is the fat content of 1%, 2% carbohydrate, 237 mg calcium, phosphorus 78 mg, 1.7 mg Fe as well as B complex vitamins, especially vitamin B2. Besides the amino acid content of snail meat is quite prominent. In 100 grams of dry snail meat among others, consists of 4.62 g leucine, 4.35 g of lysine, arginine 4.88 g, 5.98 g of aspartic acid, glutamic acid and 8.16 gr. Does not contain salmonella bacteria snail meat? It's true! But there are ways to get rid of the bacteria, ie, the correct processing techniques.Instead of the findings in the field, in Kediri, their usual eating snail meat can claim to cure hives, cough, scabies and so on. Kediri is known as the City of Tofu (Kota Tahu), but also as a forerunner of snail producers. 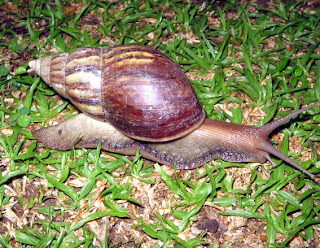 In the early 1970s only one of two village residents, and Village Jengkol & Plosokidul, District Plosoklaten, Kediri who became interested in developing and utilizing snails. Initially snail breeding business in that area, a small course. Then open stalls snails, and some are sold around. More and more people who come to try working on it. Further Kediri with snails able to attract entrepreneurs from other cities. This can be evidenced by the presence of livestock snail enthusiasts-enthusiasts, who learn and gain experience to Kediri. Based on the experience of farmers in Kediri snails, snail meat yield of approximately 15-18%. That is, from every 100 kg of fresh snails (live) will get about 15-18 kilograms of snail meat. To get good results, snail meat has to go through stages. Cleaning dirt. Surviving snails put in tank for 2 days, without any fed. Do watering every evening. It aims to spur spending and remove dirt and slime smell musty. Soaking. After cleaning, snails soaked in salt water with a little vinegar. Soaking takes approximately 5-10 minutes while stirring, then water is removed. Soaking is done 3-4 times until the water immersion becomes clear. Initial boiling. Snails that have been soaked put in boiling water for 15 minutes while inverted back, and then cooled. The separation. Snails that have been boiled earlier it had to be separated between the shells, droppings, eggs and meat. The trick is to poke the snail meat from the shell with a pick. After the meat, eggs and feces of snails out of their shells and then split. Snail eggs can be immediately washed, fried and eaten. While the meat is still need further processing. Laundering. Snail meat that has been separated from the shell, then washed clean. Better if the washing is done with running water. Soaking. Meat that has been washed, soaked in vinegar water for 15 minutes. Boiling the end. Snail meat that has been soaked was boiled again for 15 minutes. After boiled, washed once again to clean and sliced ​​according to our tastes. This snail meat that has been ready to be cooked.